The Pawnee were one of the largest and most powerful of the groups living on the central plains. Their territory extended north from central Kansas through Nebraska and included large hunting areas of the high plains to the west. According to Pawnee legend, Pawnee ancestors came from the south. Their language shows they are related to the Wichita and other Caddoan groups in Texas. They have lived in the central plains for most of the last thousand years. The Republican River in Kansas is named for the Republican (or Kitkahahki, translated as “on a hill”) band of Pawnees, who lived in what is now north central Kansas and southern Nebraska. The Republican are one of the four distinct bands of Pawnees. Their names correspond to their relative locations: Kitkahahki (Republican, west), Chaui (Grand, middle), Petahauirata (Tappage, east), and Skidi (Wolf, north). These bands lived apart, hunting separately and fighting separate battles. They share kinship with the Arikara and the Wichita. Traditionally each of the four bands built a separate village. The South Bands included the Pitahauerats or Tappage band, the Kitkahahkis or Republican band, and the Chawi or Grand band. They lived south of the Platte River. The Skidi, or Wolf band, lived to the north and did not join the South Bands until the mid-19th century when they became one group. The four bands are now recognized as a single tribe. Pawnee life was influenced by cosmology. They studied the movement of stars and developed star charts to set their calendar. The stars helped to guide the class structure, social groups, and religious rituals. 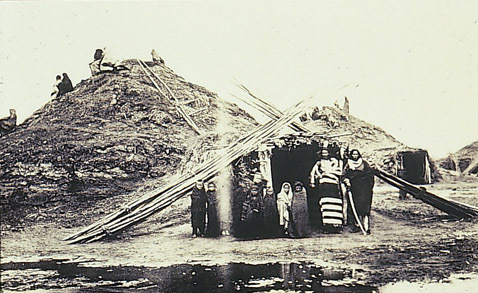 Numbering as many as 20,000 in the early 19th century, the Pawnees lived in villages featuring dome-shaped earth lodges. As large as 25 to 60 feet in diameter, the entrances to the lodges faced east. Extended families lived together in these structures that housed as many as 30 to 50 people. Each earth lodge had a center pit dug three to four feet in diameter that served as a fireplace. One example of a Pawnee village was located in what is today Republic County. During at least two settlement periods in the late 18th and early 19th centuries the Pawnee people occupied the village before returning north to the Loup River, which translates to “wolf,” in what is today Nebraska. Their relocation may have been the result of conflicts with tribal enemies. In the spring women planted gardens, producing corn, squash, pumpkins, and beans. During hunting seasons in summer and winter, nearly all members of the village traveled west to follow bison herds, covering as many as 500 miles a year. They used portable housing, pulled on a travois by dog or horse, and camped near grazing areas. The men were expert hunters and followed a chain of command in targeting, chasing, flanking, and attacking cows or young bulls. Women processed the kill, drying the meat in preparation for storage, and cleaning the skins to be used in clothing, housing, and supplies. They returned to their villages in autumn when it was time for harvest and in spring at planting time. The vegetables would be preserved in carefully organized storage pits that could be accessed throughout the year. The Pawnee gained a reputation for their courage and endurance. 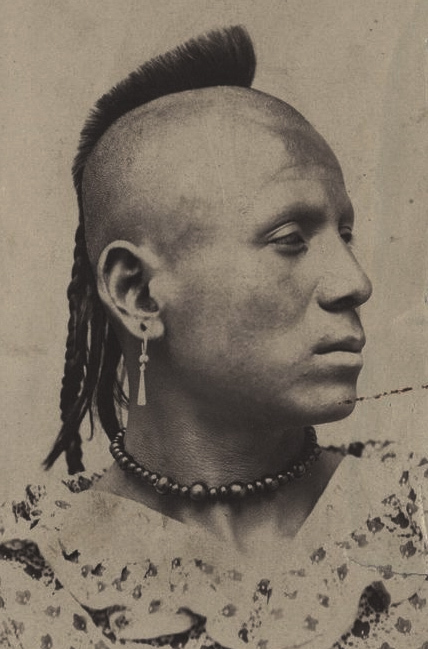 They dressed similarly to other Plains Indians, but the men’s hairstyle was unique. Their head was shaven except for a scalp lock, combed erect and curved backward. Western expansion took its toll on the Pawnee people. Smallpox and cholera, introduced by European explorers, ravaged them. Conflicts erupted as American settlers began to occupy lands the Pawnees considered hunting grounds. Clashes increased with the Sioux to the north, whose people were being pushed by settlement. The Pawnee lands diminished in negotiations with the U.S. government in 1833, 1848, 1857, and 1872. They reluctantly agreed to cede their lands in 1875 and move to what is now Pawnee County, Oklahoma. The once numerous Pawnee people were eventually reduced by 1900 to a population of about 600. Today there are more than 3,000 members of the Pawnee Nation of Oklahoma. A federally recognized government, their headquarters in Pawnee operates a tribal government, two casinos, and a number of businesses. The Pawnee Indian Museum State Historic Site in Republic County tells the story of the Pawnee people and preserves an excavated earth lodge floor. I know that robes, leggings, moccasins, bear claws, and so on are of little value to you, but we wish you have them and to preserve them in some conspicuous part of your lodge, so that when we are gone and the sod turned over our bones, if our children should visit this place, as we do now, they may see and recognize with pleasure the things of their fathers, and reflect on the times that are past. — Comments of Sharitarish, Pawnee principal chief, in presenting gifts to President Monroe, 1822, in the White House Red Room.